Whilst Creatine is produced naturally by the body (and is also available from dietary sources such as red meat and salmon), a quality supplement offers a more concentrated benefit. Creapure is the premium brand for creatine worldwide, combining high quality raw materials with a strict engineering and testing process. You must be 18 years or older to purchase this product. Loading Phase: Take 5g (approximately one level 5ml measure) and mix with 500ml of water, fruit juice or meal replacement, 4 times a day at regular intervals for 5 days. Maintenance Phase:Take 5g (approximately one level 5ml measure) and mix with 500ml of water, fruit juice or meal replacement/ Consume one serving daily. Ensure adequate hydration during and after training – minimum of six to eight glasses of water daily. No Artificial Colours, Flavours or Sweetners. No Preservatives. No added sugar. No Starch, No Corn, No Milk, No Lactose, No Soya, No Gluten, No Wheat, No Yeast, No Fish, No Porcine. Food supplements must not be used as a substitute fir a varied and balanced died and a helathy lifestyle. If you are pregnant, breastfeeding, taking any medications or under medical supervision, please consult a doctor or healthcare professional before use. Discontinue use and consult a doctor if adverse reactions occur. Caution: Consult a doctor before use if you have or have had kidney disease. Not intended for use by persons under the age of 18. Keep out of reach of children. Store in a cool, dry place. Do not use if seal under cap is broken or missing. 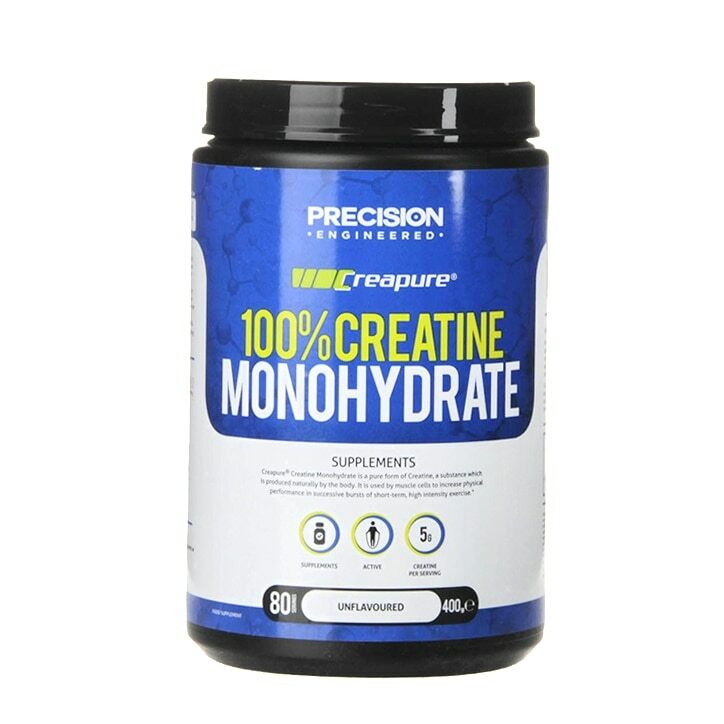 Precision Engineered Creapure 100% Creatine Monohydrate Powder is rated 4.4 out of 5 by 16. Rated 3 out of 5 by Anonymous from A few issues, time will tell On opening I was annoyed to see container is twice the size it needs to be for the contents. Yes, I know they'll claim 'settlement', but come on H&B where's a commitment to cut down on plastic packaging? Sort it out! No measuring spoon which isn't a bad thing if like me you have 'a few' in drawers, but none have such small measurements, so doseage isn't very accurate, How about offering them at the counter if needed to save putting one in every container anyway? Having said that, it seems to be working and helping with energy levels, but being really old, any growth takes a while to show, so need more time to confirm (standby). Just remember to drink loads of water, or you'll have a mouth drier than a camel herders flip-flop.